An internal police review is underway. 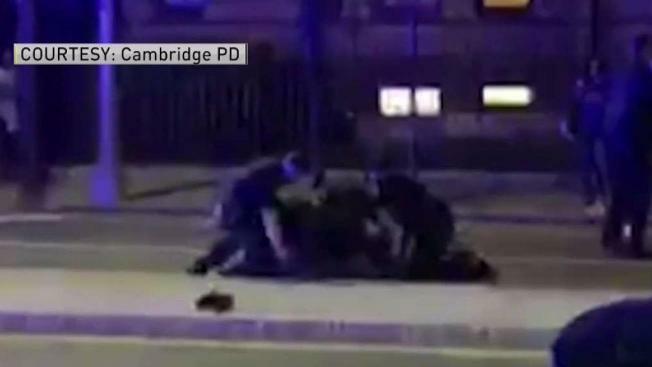 The Harvard Black Law Students Association said the arrest was "a brutal instance of police violence"
Police in Cambridge, Massachusetts, have released video that shows officers using force when arresting a Harvard University student during an incident that sparked controversy over the weekend. Selorm Ohene, 21, was arrested on charges of disorderly conduct and indecent exposure, allegedly related to being high on LSD on Friday night, according to police. The video released on Monday shows police officers scuffling with Ohene and an officer punching him while he is being detained. Officers responded just after 9 p.m. to the intersection of Massachusetts Avenue and Waterhouse Street after receiving a call that a man had thrown his clothes in a woman's face, and other calls about a man who was naked. Upon arrival, the statement said, the man's friends informed officers that he had previously taken narcotics, according to Cambridge police. Ohene declined to comment on the incident. "What is shown on the video is disturbing," Cambridge Mayor Marc McGovern said in a statement Sunday. "As mayor, I will continue working with my colleagues to make sure the horrific treatment of black Americans at the hands of law enforcement has no place in Cambridge." Another video of the arrest circulated on social media Saturday morning that caused a firestorm of controversy. That video was removed from social media later in the day. The Cambridge police officers involved are now the subject of an internal investigation. They all remain on active duty. "I absolutely do support the officers," said Police Commissioner Branville G. Bard, Jr. in a news conference Monday afternoon. "You have to judge their actions within the context of a rapidly evolving situation and not with this ideal construct." In the five page police report obtained by NBC10 Boston Saturday night, the responding officers wrote "every attempt that was made to calm Ohene down and reason with him was met with opposition." Police say the moment Ohene clenched both fists and started walking toward them in an aggressive way, it was seen as a threat. Police say he wasn't following their commands to give them his hands resulting in the punches. The Harvard Black Law Students Association released a statement Saturday, saying several of the organization's members had witnessed the incident, which the group described as "a brutal instance of police violence." "While on the ground, at least one officer repeatedly punched the student in his torso as he screamed for help," the statement read. "The officers held him to the ground until paramedics arrived, placed him on a stretcher, and put him in the ambulance. A pool of blood remained on the pavement as the ambulance departed. Shortly thereafter, firefighters came and cleaned up the blood with bleach and water." Harvard University also released a statement Saturday, saying, "The University is aware of the forcible arrest of a Harvard student by the Cambridge police department last night. We are concerned and gathering information about the facts and circumstances leading up to the arrest and understand that the city of Cambridge is reviewing the situation. University officials are also working, as they always do, to care for and support our students." The Black Students Law Association also criticized the university's handling of the incident. "Harvard University Health Services (HUHS) were the first to be called for help prior to the arrival of CPD. Instead of sending staff to support the student, HUHS transferred callers to CPD, who then responded as police often do whether cameras are rolling or not — by failing to appropriately respond to the individual needs of the person concerned and resorting to violence unnecessarily and with impunity. By involving CPD, HUHS put this student at great risk of being killed by the police." The Saturday morning Cambridge police tweet described the end of the arrest. "Three officers from the Cambridge Police and another officer from the Transit Police were required to gain compliance from the male and place him in handcuffs to avoid further injury to himself, the responding offices, or any on-lookers," the department said. "As we previously noted, use of force was required in order to effectuate the male's arrest. The primary concern I've addressed this morning focuses on punches (five in total) issued by one of the involved officers after the suspect was on the ground. In a rapidly-evolving situation, as this was, the officers [sic] primary objective is to neutralize an incident to ensure the safety of the involved party(ies), officers and members of the public ... Use of force was utilized to gain compliance from the involved party, who was displaying erratic behavior due to reports of his ingestion of drugs earlier in the evening. Once on the ground, officers were unable to gain compliance because the male contorted his body in a way that pinned his arms under his body and officers were unable to handcuff him. An ongoing struggle ensued. To prevent the altercation from extending and leading to further injuries, particularly since the location of the engagement was next to a busy street with oncoming traffic, the officers utilized their discretion and struck the individual in the mid-section to gain his compliance and place him in handcuffs." The Cambridge police department has said that it will "continue to review and refine our protocols, policies and trainings as appropriate." Ohene was transferred from a nearby hospital to another facility for in-patient treatment.